Bruce covered the song only once during the working on a dream tour in Boston. 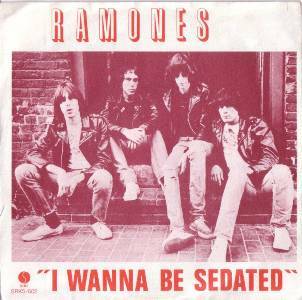 The Ramones' "I Wanna Be Sedated" was a sign request . "It's a road song. I wrote it in 1977, through the 78. Well, Danny Fields was our first manager and he would work us to death. We would be on the road 360 days a year, and we went over to England, and we were there at Christmas time, and in Christmas time, London shuts down. There's nothing to do, nowhere to go. Here we were in London for the first time in our lives, and me and Dee Dee Ramone were sharing a room in the hotel, and we were watching The Guns of Navarone. So there was nothing to do, I mean, here we are in London finally, and this is what we are doing, watching American movies in the hotel room."